The Star of David is a widely recognized symbol of Judaism, named after King David of ancient Israel, which consists of two interlocking equilateral triangles. According to legend, the Star of David may have originated from the Shield of David (known as the Magen David in Hebrew, מָגֵן דָּוִד). It may also have evolved from the mysterious Seal of Solomon (five-pointed star) that was used in the ancient world as a talisman. However, the star's pedigree as a common Jewish symbol did not become widespread until the late Middle Ages. Since that time, it has become one of the defining symbols of Judaism along with the more ancient symbol of the Menorah. The star has been used to adorn the cover of the Torah, and it is found on Jewish synagogues and tombstones. While the symbol has had a varied emotional history for the Jewish people due to its association with the Holocaust (when it was used by the Nazis to stigmatize Jews), the Star of David continues to be a heroic symbol for many Jews today. It was adopted as the main symbol on the modern flag of the State of Israel created in 1948. There are several interpretations of the meaning of the Star of David. Most frequently, the star is associated with the number seven (derived from the six points plus the center). This number has considerable religious significance in Judaism, which can be noted in several examples including the six days of Creation plus the seventh day of rest, as well as the Seven Archangels of God. 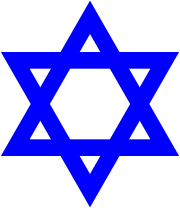 In the same vein, the Star of David may have evolved as an abstract symbol of the Menorah (the more traditional symbol for Judaism that once stood in the Temple of Jerusalem), due to its association with light as well as its geometric organization into 3+3+1, which corresponds to the seven branches of the Menorah. Another view of the Star of David locates its meaning in the name David itself. In Hebrew spelling (דוד), David contains only three characters, two of which are "D" (or "Dalet," in Hebrew). In ancient times, this letter was written in a form much like a triangle, similar to the Greek letter Delta (Δ). Thus, the symbol may have been a family crest formed by flipping and juxtaposing the two most prominent letters in the name. The hexagram is also known as the "King's Star" in astrological circles, and was an important astrological symbol in Zoroastrianism, which may represent the astrological chart at the time of David's birth or anointment as king. While the exact origins of the symbol's relation to Jewish identity are unknown, a popular folk story tells that the Star of David is literally modeled after the shield of the young Israelite warrior David (later to be King David). In order to save metal, the shield was not made of metal but of leather spanned across the simplest frame that would hold the round shield: two interlocking triangles. However, no reliable historical evidence for this alleged origin exists. The earliest archaeological evidence for the Jewish use of the symbol comes from an inscription attributed to Joshua ben Asayahu in the late seventh century B.C.E. : Sidon. The earliest extant Jewish text to mention it is the Eshkol Ha-Kofer by a Karaite named Judah Hadassi, from the twelfth century C.E., which states: "Seven names of angels precede the mezuzah: Michael, Gabriel, etc. ... Tetragrammaton protect you! And likewise the sign, called the 'Shield of David', is placed beside the name of each angel." 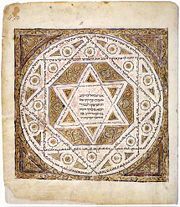 In medieval Judaism, popular Kabbalah made use of the Star of David, arranging the Ten Sephiroth, or spheres, in it, and placing it on amulets. Kabbalistically, the Star/Shield of David symbolizes the six directions of space plus the center, under the influence of the description of space found in the Sefer Yetsira: Up, Down, East, West, South, North, and Center. Congruently, under the influence of the Zohar, it represents the Six Sefirot of the Male (Zeir Anpin) united with the Seventh Sefirot of the Female (Nekuva). However, the sign is nowhere to be found in classical kabbalistic texts themselves, such as the Zohar and the like. Therefore, its use as a sefirotic diagram in amulets is more likely a reinterpretation of a preexisting magical symbol. It has been suggested that Isaac Luria influenced the Star of David becoming a national Jewish emblem by teaching that the elements of the plate for the Seder evening have to be placed in the order of the hexagram, above the three sefirot "Crown, wisdom, and insight, below the other seven." Eventually, the hexagram was employed as an architectural ornament on synagogues, as it is, for example, on the cathedrals of Brandenburg and Stendal, and on the Marktkirche at Hanover. The earliest Jewish literary source that mentions the Shield of David is the Eshkol Ha-Kofer by Judah Hadassi from the mid-twelfth century C.E., where seven shields are used in an amulet for a mezuzah. A manuscript TaNaK dated 1307 and belonging to Rabbi Yosef bar Yehuda ben Marvas from Toledo, Spain, was decorated with a Shield of David. In 1354, King Charles IV of Bohemia prescribed for the Jews of Prague a red flag depicting both David's shield and Solomon's seal. Later, it is recorded that the Jews met King Matthias (Mathios Kuruvenus) of Ofen (Budapest, Hungary) in 1460 with another red flag showing two pentagrams with two golden stars. The pentagram, therefore, may also have been used among the Jews. It occurs in a manuscript as early as the year 1073. In a Hebrew prayer book, printed in Prague in 1512, a large Shield of David appears on the cover. In the colophon is written: "Each man beneath his flag according to the house of their fathers...and he will merit to bestow a bountiful gift on anyone who grasps the Shield of David." In 1592, Mordechai Maizel was allowed to affix "a flag of King David, similar to that located on the Main Synagogue" to his synagogue in Prague. In 1648, the Jews of Prague were again allowed a flag, in acknowledgment of their part in defending the city against the Swedes. On a red background was a yellow Shield of David, in the center of which was a Swedish star. The Star of David can also be found on the tombstones of Jews going back hundreds of years in Europe, as it became accepted as the universal symbol of the Jewish people. Following Jewish emancipation after the French Revolution, Jewish communities chose the Star of David to represent themselves, comparable to the cross used by most Christians. Some Orthodox Jewish groups, however, reject the use of the hexagram Star of David because of its association with magic and the occult and they do not recognize it as a Jewish symbol. Some Haredi groups, such as Neturei Karta and Satmar, reject it because they associate it with Zionism. Nevertheless, many Modern Orthodox synagogues, and many synagogues of other Jewish movements, have the Israeli flag with the Star of David prominently displayed at the front of the synagogues near the Ark containing the Torah scrolls. Jewish lore links the Star of David symbol to the Seal of Solomon, the magical signet ring used by King Solomon to control demons and spirits. Scholars once speculated that the hexagram may be a relic from Ancient Egyptian religious practices, adopted by Jews engaged in the occult and syncretism as early as the era of King Solomon. However such claims are unlikely due to the scarcity of evidence in Egyptian religious practices B.C.E. Where Hellenistic Gnostics and Egyptians did use pentagrams in their amulets (such as the "pentalpha" symbol), they did not use hexagrams, which is notably absent from the ancient papyri. Jewish lore also links the symbol to a magic shield supposedly owned by King David that protected him from enemies. The Shield of David is not mentioned in ancient rabbinic literature. A supposed “David's Shield,” however, has recently been noted on a Jewish tombstone at Taranto, in Southern Italy, which may date as early as the third century C.E. Likewise, a stone bearing the shield from the arch of a third or fourth century synagogue in the Galilee was found. A Star of David, often yellow, was used by the Nazis during the Holocaust as a method of identifying Jews. After the German invasion of Poland in 1939, there were initially different local decrees forcing Jews to wear a distinct sign (e.g. in the General Government, a white armband with a blue Star of David on it, in the Warthegau a yellow badge in the form of a Star of David on the right side of the breast and on the back.) The requirement to wear the Star of David with the word Jude (German for Jew) inscribed was then extended to all Jews over the age of six in the Reich and the Protectorate of Bohemia and Moravia by a decree issued on September 1, 1941 and signed by Reinhard Heydrich. It was gradually introduced in other German-occupied areas, where local words were used (e.g. Juif in French, Jood in Dutch). Jewish inmates in concentration camps were later forced to wear similar Nazi concentration camp badges. The Star of David continues to be a heroic symbol for many modern Jews, and it has been adopted on the flag of Israel with the creation of the modern State of Israel in 1948. In modern Israel, the Star of David is used by the Magen David Adom (MDA) (Red Shield of David), Israel's only official emergency medical, disaster, and ambulance service. It is an official member of the International Committee of the Red Cross. ↑ Jacobs, Joseph, Magen Dawid. Retrieved August 3, 2007. ↑ Oegema, G.S. Realms of Judaism. The History of the Shield of David, the Birth of a Symbol. (Peter Lang, Germany, 1996.) ISBN 3-631-30192-8 ; Hatakh ha-Zahav, Hotam Shelomoh u-Magen-David (Poalim, 1990,) p.156. ↑ Kashani, Reuven, The National Flag. Retrieved August 3, 2007. ↑ Israel Ministry of Foreign Affairs. King Solomon’s Seal. Retrieved August 3, 2007. ↑ Museum of Tolerance Multimedia Learning Center, Encyclopedia of the Holocaust. Retrieved August 3, 2007. ↑ Polizeiverordnung über die Kennzeichnung der Juden. Retrieved August 3, 2007. Friedmann, M. Seder Eliyahu Rabbah ve-Seder Eliyahu Ztṭa. Vienna. 1901. Schwandtner. Scriptores Rerum Hungaricarum, ii. 148. Starbird, Margaret. The Archetypal Mandala of the Star of David. History of "Star of David"
This page was last modified on 21 October 2015, at 15:32.